The piqué arabesque is a ballet staple that looks deceptively simple. At Alonzo King LINES Dance Center, LeeWei Chao uses the image of standing on the edge of a cliff to inspire correct alignment, emphasizing a strong supporting side so that dancers avoid tilting and dipping forward. "Your body energy goes up," he says. "Stay on that edge of the cliff. You sense the danger there, but that's the most beautiful moment." LeeWei Chao is from Taipei, Taiwan. He trained in the Vaganova method before dancing with Taipei City Ballet, Henry Yu Dance Company and Singapore Dance Theatre. 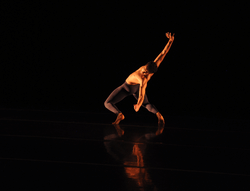 After moving to the U.S., he danced with the Joffrey Ballet and Milwaukee Ballet. He is currently on faculty at Smuin Ballet and Alonzo King LINES Ballet, and he teaches ballet, men's technique and pas de deux for the LINES BFA program, LINES Dance Center, summer program and training program. Chao is also a choreographer who has set work on Milwaukee Ballet, Oklahoma City Ballet and New Mexico School of the Arts, among others. Hayley Bowman is a graduate of the Alonzo King LINES Ballet BFA program with the Dominican University of California. She is a freelance dancer and teacher in the San Francisco Bay Area.